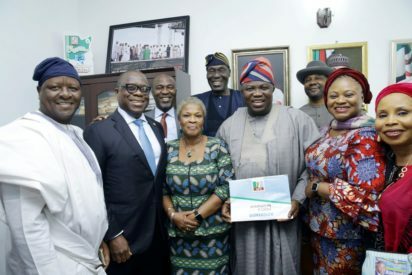 The incumbent Governor of Lagos State, Akinwunmi Ambode today, Monday, finally picked his interest of expression and nomination form for his second term bid in the forthcoming 2019 general poll. Ambode, after picking his nomination form, formally declared his intention for re-election at rally on open ground, Alausa, Ikeja, attended by Senator Gbenga Ashafa, representing Lagos East, party chieftains, leaders, members of APC, among others. Ambode who just returned from China with President Muhammadiu Buhari from a diplomatic trip, had been having a running battle with his godfather, and national Leader of the party, Asiwaju Bola Tinubu for endorsement. Ambode has been embroiled in controversy lately over Tinubu refusal to endorse his second term bid. Initially, there were speculations that Tinubu endorsed Ambode for second term in office but was later erased following failure of Tinubu to publicly declare Ambode for second term till date. The report had claimed Tinubu settled for Ambode after the Vice President, Prof. Yemi Osinbajo; Oba of Lagos, Oba Rilwan Akiolu, and Majority Leader of the House of Representatives, Hon. Femi Gbajabiamila, prevailed on the APC leader to support Ambode’s re-election plan. Trouble had started for Ambode following irreconcilable differences between the duo such as alienating Tinubu’s foot soldiers from scheme of things in the sate, as well as muzzling of those in the cabinet and around. Starvation of the party with fund is another sin leveled against Ambode who was initially unperturbed.